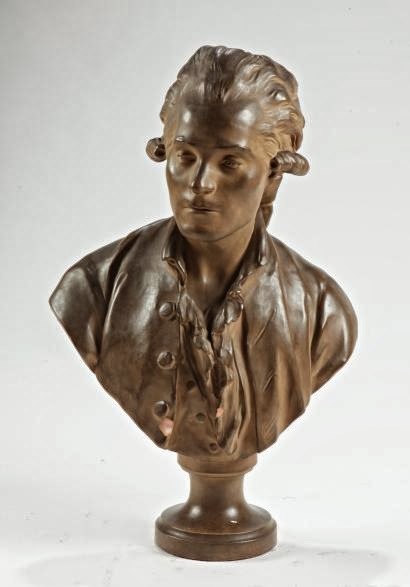 Rodama: a blog of 18th century & Revolutionary French trivia: Houdon's Robespierre? 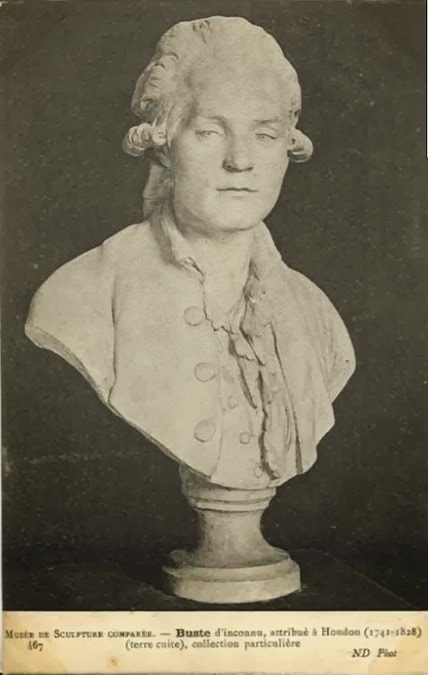 According to the caption, this photograph, published on a Belgian blog, represents a bust of Robespierre by Houdon which has been "scandalously hidden from the public" since 1905 in the vaults of the Musée de l'Histoire de France at Versailles. The picture is reproduced on several other sites, most of them Russian; in some it is clearly a page from a book, annotated "Robespierre", but there is no proper reference or explanation given. 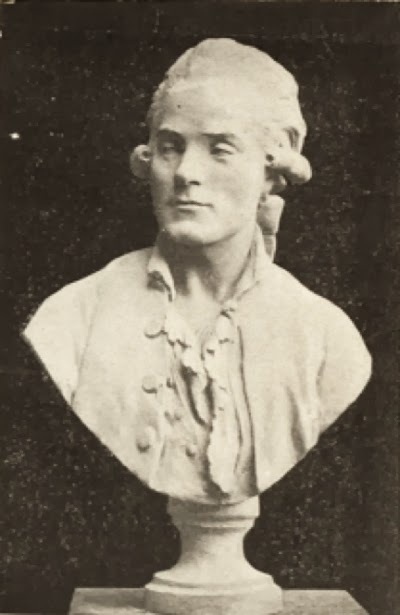 The consensus among the experts is that, although Houdon probably created a life mask of Robespierre, he never actually went on to make a sculpture. So what is going on? Illumination is provided by a 1991 catalogue for the Museum of Art, Rhode Island School of Design (RISD) available on Google Books. S40 is an example of the same bust by Houdon. The entry explains that there is little information available but in the late 19th century the subject was commonly misidentified as Robespierre. The statue now in Rhode Island came originally from a Belgian collection and is signed and dated 1774. The material is plaster tinted to resemble fired clay, and small metal pins throughout the surface suggest that it was the original cast used for modelling finished versions. 1. A plaster, formerly in the collection of Jacques de Saint-Pierre. 2. A cast from a lost terracotta which belonged to the sculptor Henri Chapu, who himself made a cast for the Musée des monuments français (in the Palais de Chaillot) - possibly the cast in the postcard below. 3. The sculpture now in the RISD, originally part of the Thoen Collection, Brussels. It is not clear which, if any, of these versions is the one which ended up in Versailles. In addition there is a fourth sculpture in the Musée d'Orléans, which is identified as a Bust of Laurent Gilbert. Houdon's biographer Georges Giacometti apparently doubted the authenticity of this sculpture. I can't find the reference, so I'm not sure quite why, but, on the face of it, Laurent Gilbert is a tempting candidate for the subject. Nicolas Joseph Laurent Gilbert (1750-1780) was a satirical poet who made something of a name for himself as a panegyrist of Louis XV and opponent of the Encyclopedists. He first arrived in Paris in 1774 so the dates fit. More to the point - it looks like him! 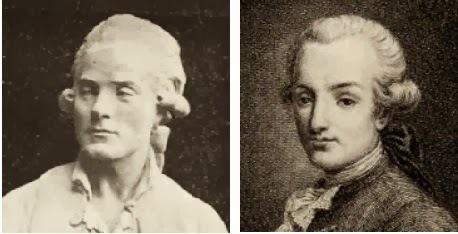 The idea that the statue is Robespierre can probably be explained by its superficial resemblance to the sculpture of Robespierre by Claude André Deseine. Other example of the bust turn up from time to time at auction, and there is also a notable later copy on display in the Café Procope. But sadly none of them is Robespierre! Sold at auction by Drouot. I can't see Max letting himself be sculpted without his cravat being properly tied, anyway!